Meet my twelve doctoral students. None. I am on leave this academic year. 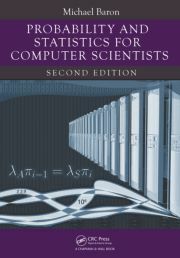 Textbook "Probability and Statistics for Computer Scientists"
I wrote this textbook for junior undergraduate through beginning graduate level students, and it can be used as the first course in Probability and Statistics. One semester of Calculus that includes limits, derivatives, and integrals, is assumed, although the main Calculus concepts are reviewed in Appendix. Each chapter has numerous examples and exercises. Instructors get a complete Solutions Manual. Matlab codes are supplied for impressive classroom demonstrations. The second edition came out in 2014. Dr. Michael Baron is Professor of Statistics at the University of Texas at Dallas. Supported by grants from the National Science Foundation, the National Security Agency, the Actuarial Foundation, and the Semiconductor Technical Council, he conducts research in the areas of sequential analysis, change-point detection, and Bayesian inference, applying obtained results in epidemiology, clinical trials, cyber security, energy finance, and semiconductor manufacturing. The last application brought M. Baron to IBM T. J. Watson Research Center, where he was a one-year Academic Visitor in 2003-04. M. Baron has published two books, a number of research articles and book chapters, and gave an even greater number of invited presentations and seminars. In 2007 M. Baron received Abraham Wald prize for the best paper in sequential analysis, and in 2013 he was elected a Fellow of the American Statistical Association. Currently, he serves as Associate Editor of the Journal of Sequential Analysis. He is a member of the American Statistical Association and the International Society for Bayesian Analysis. M. Baron has a University Diploma in Mathematics from St. Petersburg State University, Russia (1992), and a Ph.D. degree in Statistics from the University of Maryland (1995). His University Diploma paper entitled "On the First Passage Time for Queueing Processes" was supervised by Prof. Ildar Ibragimov, and his doctoral dissertation "Confidence Estimation in the Change-Point Problem" was supervised by Prof. Andrew Rukhin. In his turn, M. Baron graduated nine doctoral students and is currently working on two more. During his free time, he travels and plays piano, go, bridge, and ice hockey.